Dr. Jeff Vasta enjoys taking a cruise with his family, boarding over 22 ships and only getting sick once. "It was probably a situation where people weren't washing their hands and got an upper respiratory illness, nausea, vomiting, that kind of thing," Jeff told ABC Action News anchor Wendy Ryan. His wife, Julia Vasta, says the norovirus made him more sick than she's seen him in years. "He was in the room for two days quarantined, vomiting with this norovirus. There was other people on board that were sick at the same time. It all happened kind of at the same time," Julia explained. In a special Dirty Dining I-Team investigation, we looked at the last year of reports from the CDC Vessel Sanitation Program finding 15 ships had the norovirus and 10 of those ships sailed out of ports here in Florida leaving from Tampa, Port Canaveral, Miami and Fort Lauderdale. And the cruise lines contaminated with the norovirus? Oceania, Princess, Disney, Carnival, Royal Caribbean, Norwegian, Holland America and more. In March of this year, the norovirus hit the Coral Princess Ship with 157 passengers getting sick along with 25 crew members. But just ten days before the Coral Princess set sail, the ship scored 100 percent on their vessel sanitation inspection. And the Oceania's Riviera Cruise ship hit rough waters in the last year with three different cruises, all out of Miami carrying the norovirus. 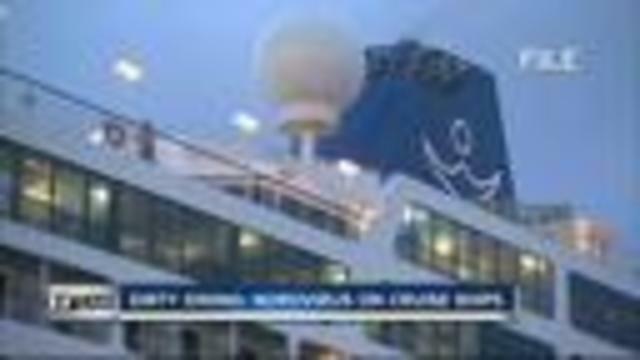 Two back to back cruises in February and another in March with hundreds on-board falling ill. But the ship still received a 96 percent inspection score during that time. According to the CDC, the norovirus does not necessarily have anything to do with the ship's sanitation practices. "If they followed their plan that they're required to have to mitigate the outbreak, then it would not necessarily need to be mentioned on the report," said Commander Aimee Trefiletti, who's the Chief of the CDC's Vessel Sanitation Program. "One of the things we require the ship to have is an 'Outbreak Prevention and Response Plan,'" Trafiletti explained. And often the only way you'll know a specific ship was contaminated with the norovirus? Finding a separate link on the CDC's website under 'Outbreak Updates' and not under their inspection scores . Hillsborough County Epidemiologist Mike Wiese says the norovirus can live on surfaces for not just hours but days, making it extremely contagious. "The virus is pretty good at living on surfaces. It can live on a hard surface for up to a couple weeks," Wiese said. And touching potentially contaminated surfaces like a ship's elevator buttons, hand-rails, buffet utensils, and door knobs can spread the virus quickly. And it's not just person to person. It can even be in the food. "Ready to eat produce, fruits and vegetables, we know that those can be contaminated with the norovirus. And shell fish can also be contaminated with norovirus," Wiese explained. Recovering from the norovirus can be life-threatening, too. "For the very young infants and the elderly, it can be pretty serious that could require hospitalization," Wiese said. And as you've heard countless times, hand washing with soap and water is the best way to avoid getting sick. And Weise says don't rely on hand-based sanitizers. "Hand sanitizers are not necessarily that effective against the norovirus," he added. And despite contracting the norovirus in the past, Jeff says it's smooth sailing from here. "It didn't stop you from getting on another cruise?" Ryan asked. "No, not at all!" Jeff assured her. On day 5 of 10, the Coral Princess experienced a sudden increase in cases of Acute Gastroenteritis reporting to the medical center. These cases were confirmed by onboard testing to be caused by norovirus. In response, a company Public Health Officer was deployed to the vessel, and the ship implemented immediate and aggressive sanitation protocols developed in coordination with the US Centers for Disease Control and Prevention (CDC). The ship saw the number of new cases dramatically decrease over the subsequent days and by the end of the cruise, the number of new cases was back to baseline. In an abundance of caution, the ship launched a comprehensive disinfection program onboard during the turnaround on 18 March 2017 in Port Everglades, FL. All areas onboard the ship were thoroughly disinfected. Cleaners were contracted to disinfect the terminal and coaches. All guests on the subsequent cruise were advised of the situation and associated delays. The Chief of the US CDC- Vessel Sanitation Program attended the vessel during the turnaround and provided positive comments during her time onboard. Making multiple daily reports of gastrointestinal illness cases to the VSP. CDC Vessel Sanitation Program is monitoring the outbreak and the ship's response procedures. Specimens have been collected, tested onboard and found to be positive for norovirus. The specimens will be sent to CDC for additional testing. planning staged disembarkation for active cases to limit the opportunity of illness transmission to well guests, and planning for sanitation of terminal and transport infection control procedures. A CDC Vessel Sanitation Program environmental health officer and an epidemiologist are currently making plans to board the ship upon arrival in Miami, FL to conduct an environmental health assessment and evaluate the outbreak and response activities. Specimens have been collected and tested onboard using a norovirus rapid test; results were positive for norovirus. The specimens will be sent to CDC for additional testing. Reported gastrointestinal illness cases to the VSP. A CDC Vessel Sanitation Program environmental health officer boarded the ship upon arrival in Miami, FL to conduct an environmental health assessment and evaluate the outbreak and response activities. Specimens were collected and sent to CDC for testing; results were positive for norovirus.